Feel the history and design in the tranquil Algarve. The typical Algarve houses and the flowered streets of Estoi village, situated a few kilometers from Faro, lead us to the Pousada Palácio de Estoi - Monument Hotel + SLH that was projected for a superb century building of Rococo architecture. The construction of the palace began in the late 19th century and finished with the celebration of a grand party in the gardens in 1909. 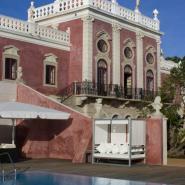 It remained in the family of the Viscount of Estoi, and in the late 20th century was bought by the state that approved its transformation into a hotel. Today, this hotel is composed by the recovered main building, with its exuberant salons, frescoes, tea pavilions, fantastic Versailles style gardens and former stables and cow sheds, now converted into spaces for holding all sorts of events. In contrast with this historical surrounding, a new modern wing was built to receive the rooms, with design and furniture in contemporary style, and with windows that open onto a tranquil countryside or pool view. Take advantage of your stay to feel the difference of the tranquillity of Algarve's interior, discover the history of the Milreu Roman Ruins and the neighbouring cities of Faro and Tavira, without missing the famous golf courses and extensive golden sand beaches.